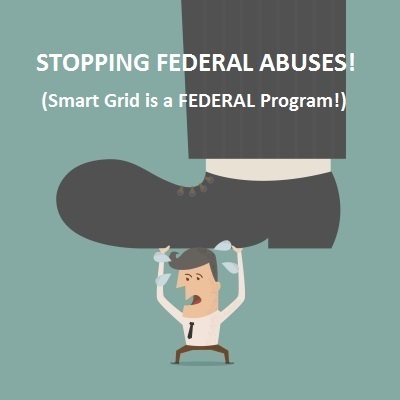 Smart Meters Are Only One Example of Federal Abuses! Michigan Stop Smart Meters is non-partisan. We do not endorse political parties or candidates for office. In order to build the broadest possible coalition, we do not usually get involved in issues other than smart meters. But we have seen so many examples of a growing federal tyranny in this country, of violation of our rights as citizens, of unconstitutional acts of our government, that it is impossible to remain silent about the overall trend of these matters. Our federal government now boldly asserts the right to spy on ALL the communications of ALL of us, and to lock any of us up indefinitely without charges or a trial. Can it be any great surprise then that they now also assert the right to spy on us in our homes, to control our appliances and even to make many of us sick in the process? There is a pattern to all this. What we are learning is that elections make no difference to the long run trends. We are learning that, all too often, people spend thousands of dollars fighting injustices in courts, only to have their lawsuits thrown out by system loyal judges on the flimsiest of pretexts. We are learning that powerful interests really control this country and NOT the leaders we thought we were putting in power with the last election. Smart meters are just one facet of this. This is a federal program with our federal tax dollars being used, in effect, to bribe utility companies and state regulators. The rights of individual utility customers are being trashed. Legislators, Attorney Generals and courts are choosing to maintain the “system” rather than to defend the citizens. Happily there are a few exceptions now and then as when the Michigan House Oversight Committee, under the leadership of now retired Rep. Tom McMillin, held a four hour hearing where most of us got a chance to voice our protests on the smart meter issue. Still, we have to wonder what will come of that hearing. After all, McMillin’s committee heard our grievances only after the House Energy and Technology Committee refused to do so. Is there going to be any desire in the new legislative term to follow through with a meaningful new law? Or is it going to be business as usual with our elected state lawmakers being manipulated by powerful corporations and by an all-powerful federal government? More and more we are going to have to see the broader picture of which smart meters are only one part. We are going to have to find the will, the courage and the means to challenge a federal government that is out of control. We can’t do that by “voting the bums out”. We have seen over and over that doesn’t work. We only get new bums. And we have seen over and over that the federal court system does not check federal abuses. This entry was posted in Actions by Federal Courts, Actions by Public Service Commission, Actions by State Government, Legal Challenges, Political Causes of Present Crisis and tagged DTE Energy, DTE meters, Fourth Amendment, Michigan Public Service Commission, Michigan smart meters, MPSC decision found unreasonable, privacy law, smart meter bullying, smart meter fraud, smart meter law, smart meter legislation, surveillance device by Vigilant Dave. Bookmark the permalink. Did you see the following article on the drudge report? .C.L.1970,,125.486::;;;;;LIBRARY REFERENCES. …….HEALTH AND ENVIRONMENT. 13 (1),14……..C.J.S. HEALTH AND ENVIROMENT 27,30. ACQUIRED FROM WAYNE STATE LAW LIBRARY .THIS Is A VALID FEDERAL LAW, .SEE IF IT CAN BE OUSE TO MAYORS WHO WANT TO BAN AMI FROM THEIR COMMUNITY.